Sleek! Modern in design, beautiful in finish, the handsome and businesslike appearance of the Remington Rand Model 1 also functions with precision. 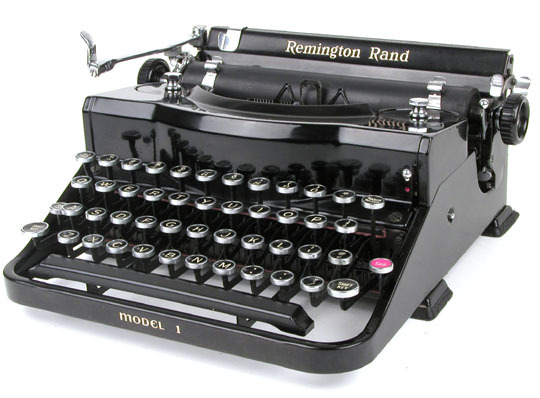 The vibrationless mechanism introduced here gives a sweet feel to typing on this machine. 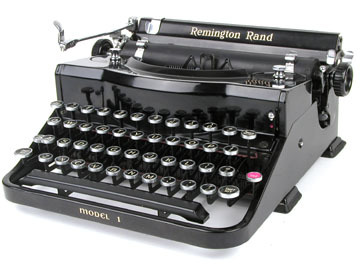 According to one Remington brochure, the Model 1 is "without question" the finest standard portable ever built. It was targeted to teachers, writers and businesspeople who cranked out lots of documents -- and who needed a quick, clear easy-to-use machine. A later version of the Model 1 features a smoothly curved front instead of the facet front as shown in the picture.